To sign the petition email your logo and a short statement to alltrials@senseaboutscience.org. 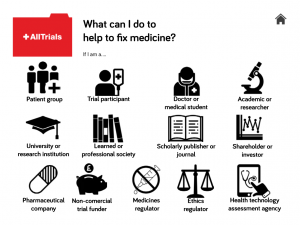 Joining AllTrials means you support the principle of the AllTrials campaign. Read more. Watch, share and host the AllTrials videos. Urge your staff or members sign the AllTrials petition as individuals. Share a link to the petition and the AllTrials button on your website. Encourage other organisations you work with to join the campaign. Find out how your organisation can help fix medicine with our roadmap.